Update 5:00pm: Zillow has released a statement saying the company has "decided against moving forward with legal action." EFF is pleased that Zillow has withdrawn its threat and won't be seeking to take down any of the posts on McMansion Hell. We hope that other companies seeking to shut down humor, criticism, and parody online see this as a cautionary tale and avoid sending threats in the first place. Earlier this week, Zillow sent an aggressive cease and desist letter [PDF] to Kate Wagner, the creator of the McMansion Hell website. Zillow demanded that Wagner remove any image originally sourced from Zillow’s site. Today EFF sent a response to Zillow on Wagner’s behalf. Our letter [PDF] explains why none of Zillow’s contentions have any merit. Zillow should abandon its demand and respect online freedom of expression. McMansion Hell is an architecture blog focused on contemporary residential housing. Using humor and parody, Wagner tries to illustrate the architectural horror of modern McMansions. Her posts usually include annotated photographs of houses to illustrate her commentary. In addition to posts critiquing individual homes, Wagner publishes essays about urbanism, architecture, sociology, and interior design. After receiving Zillow’s threat, Wagner temporarily disabled access to her blog via McMansionHell.com. She is relaunching the blog in full today. Zillow’s demand letter made a number of highly dubious legal claims. For example, Zillow argued that Wagner does not make fair use of the photographs she annotates. Importantly, Zillow does not own, and cannot assert, the copyright in these photos. But even if it could, McMansion Hell’s annotation of photographs for the purpose of criticism and commentary is a classic example of fair use. Zillow also suggested, without any explanation, that Wagner may have violated the Computer Fraud and Abuse Act (CFAA). EFF has long fought against overbroad applications of the CFAA, which is the federal anti-hacking statute intended to criminalize unauthorized intrusions into computer networks. There is no basis for a CFAA claim against Wagner. To the extent Zillow was suggesting that she might have violated the CFAA by violating Zillow’s terms of service, courts have repeatedly rejected such claims. Zillow’s letter unleashed a wave of negative publicity for the company. In response, Zillow has insisted that it did not intend to shut down Wagner’s blog. However, it does appear to be standing by its demand that she remove all images sourced from Zillow’s website. Zillow has no basis for such a demand and our client will not be removing any previous posts. She has informed Zillow, however, that she is not interested in using its site for her blog in the future. 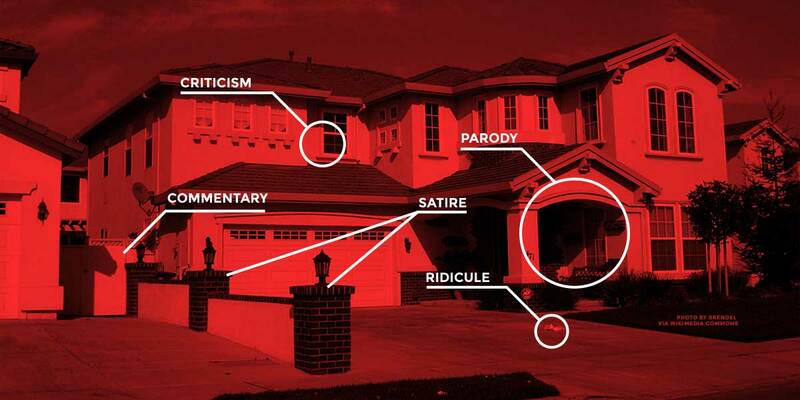 We hope Zillow does the right thing and renounces its attempt to censor McMansion Hell.